Nucleosides are glycosylamines that can be thought of as nucleotides without a phosphate group. 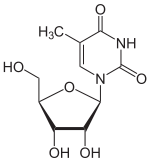 A nucleoside consists simply of a nucleobase (also termed a nitrogenous base) and a 5-carbon sugar (either ribose or deoxyribose), whereas a nucleotide is composed of a nucleobase, a five-carbon sugar, and one or more phosphate groups. In a nucleoside, the base is bound to either ribose or deoxyribose via a beta-glycosidic linkage. 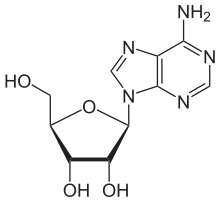 Examples of nucleosides include cytidine, uridine, adenosine, guanosine, thymidine and inosine. 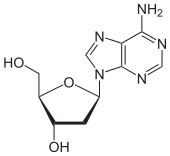 While a nucleoside is a nucleobase linked to a sugar, a nucleotide is composed of a nucleoside and 1 or more phosphate groups. Thus, nucleosides can be phosphorylated by specific kinases in the cell on the sugar's primary alcohol group (-CH2-OH) to produce nucleotides. Nucleotides are the molecular building-blocks of DNA and RNA. in the lumen of the digestive system by nucleosidases into nucleobases and ribose or deoxyribose. inside the cell into nitrogenous bases, and ribose-1-phosphate or deoxyribose-1-phosphate. 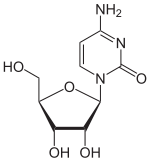 In medicine several nucleoside analogues are used as antiviral or anticancer agents. The viral polymerase incorporates these compounds with non-canonical bases. These compounds are activated in the cells by being converted into nucleotides. They are administered as nucleosides since charged nucleotides cannot easily cross cell membranes. In molecular biology, several analogues of the sugar backbone exist. Due to the low stability of RNA, which is prone to hydrolysis, several more stable alternative nucleoside/nucleotide analogues that correctly bind to RNA are used. This is achieved by using a different backbone sugar. These analogues include LNA, morpholino, PNA. In sequencing, dideoxynucleotides are used. These nucleotides possess the non-canonical sugar dideoxyribose, which lacks 3' hydroxyl group (which accepts the phosphate). It therefore cannot bond with the next base and terminates the chain, as DNA polymerases cannot distinguish between it and a regular deoxyribonucleotide.